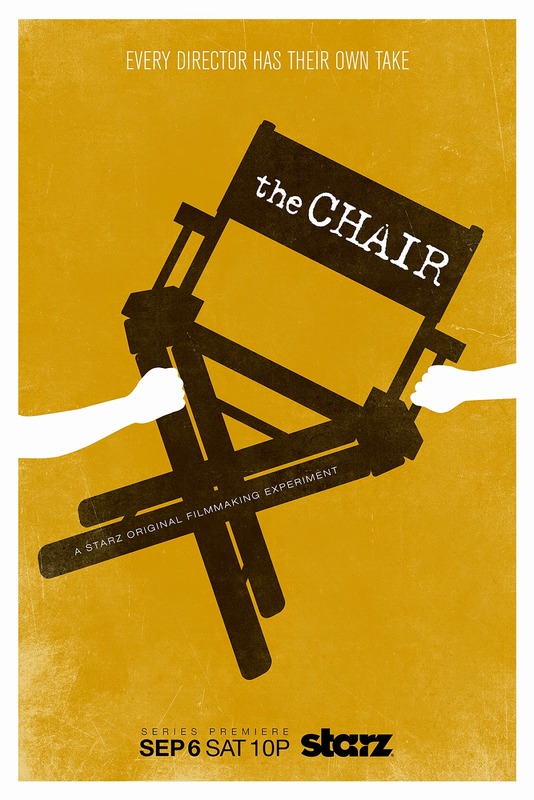 When Starz made two episodes of documentary series The Chair (debuts September 6 at 10/9c) available to critics, I was unaware the series existed. After watching the two episodes, I was aware the show existed, but I still didn’t necessarily understand how it worked. The Chair, as a television series on Starz, is a documentary about two filmmakers—YouTube personality Shane Dawson and independent filmmaker Anna Martemucci—who are each making a movie in Pittsburgh based on the same initial script. It’s an experiment both in terms of understanding the way a script changes depending on the creative forces bringing it to life on screen, as well as considering the specific contrasts in filmmakers who emerge in wildly different creative environments. However, in addition to being a documentary, The Chair is also a competition, which is the element that was dramatically unclear in watching the series. Although a $250,000 prize is on the line, there were no specific details on how this prize would be awarded. There was the insinuation it would involve some form of audience voting, but the lack of clear details meant I had a wide range of questions about the series’ structure for Starz’s Summer Press Tour session about the project. I’ll likely talk more about the series itself as we get closer to its September premiere, but the answers to some of those questions are more pertinent in the leadup to the premiere and the promotional campaign around The Chair. At the core of my question, in truth, is not only how this is going to function as a competition series, but also why it is going to function as a competition series. The answers to both questions were vague, but they speak to a project that shares a rather strange relationship to its stars, its network, and to the communities it seeks to draw interest from. The “why” question is admittedly a complicated one. On the surface, there is no reason why this needs to be a competition series. When Dawson and Martemucci were asked about whether they were concerned about winning, both expressed that they had gotten enough out of making a movie on their own terms with someone else’s money that they would see any financial reward as a less significant impact on their life. This is, of course, in hindsight: at the time, it’s possible the notion of a cash prize is what convinced each of them to sign up to be followed by cameras for 12 hours a day and broadcast their emotional highs and lows over the course of the production. However, the fact remains that the most interesting parts of the series—the contrast between the two productions—would be retained if this was an experiment without the direct competition element (which only manifests through editing, as the press tour session was actually the first time Dawson and Martemucci had met). From producer Chris Moore’s perspective, though, the cash prize served the purpose of giving a boost to one of the filmmakers to help support their career in greater detail. I buy this argument, although they could have simply split the $250,000 between them and had the same basic impact in supporting young filmmaking. Beyond that, although he didn’t mention this specifically, the competition element also gives viewers a reason to be invested in these films, and gives the production a way to engage with audiences directly. In an environment where connecting with audiences is crucial to a series’ success, it’s possible that the competition element was necessary for Moore to sell the series to Starz, which may have been less interested in a documentary series without the cross-platform promotional push the voting process will offer. My question for Moore, however, was tied to how any voting process will deal with a substantial gap between the online followings of Dawson and Martemucci. Neither was cast through a “nationwide search” or anything like that: both were clearly recruited based on the different perspectives they would offer and the different audiences they would draw in. In Martemucci, The Chair is drawing on personal relationships, as series mentor Zachary Quinto has worked with her and her husband Victor Quinaz through his Before the Door Productions banner; in Dawson, meanwhile, the show is not-so-subtly relying on his substantial online fanbase—Dawson’s primary YouTube account has nearly six million subscribers*—to draw audiences to the project. By comparison, Martemucci and Quinaz’s PERIODS. YouTube channel has just over six thousand subscribers, a meaningful number for an independent film collective but small change next to Dawson’s legion of online fans (which also includes over two million Twitter followers—Martemucci has just over 1600). *Starz’s promotional material lists this number as ten million, but that is adding up Dawson’s three different YouTube accounts, and I’m fairly certainly fails to acknowledge that many of those who subscribe to the main channel are likely duplicated in the subsequent channels. Accordingly, my question was how precisely you could design any sort of audience voting system that would not logically skew toward the person with the dramatically more substantial online following. Moore’s response—after expressing his wish that they had had more fun questions before addressing such a comparatively substantial topic—was that they had a plan. It apparently involves Survey Monkey, and an evaluation process that goes beyond someone simply voting for a particular film. He gave the example of questions like “Would you recommend this movie to a friend?” and intimated that they were finding ways to make it so that someone wouldn’t just be filling out the survey to vote for a single film. Although he was still vague on specific details, he at least seemed to acknowledge that the competitive component of his series had a serious problem, one that he would at least have to try to address. Thinking practically, I think Moore is underestimating the devotion of online fanbases: regardless of what kind of system he puts in place, Dawson’s fans will find a way to work through it to support his film, just as they reply to each of his tweets expressing their love for him, or comment on his YouTube videos hoping to gain his attention. Dawson doesn’t just have people who read or watch what he says or creates: he has fans that, by nature of YouTube as an inherently participatory platform, are conditioned to respond to requests and engage with his content. When he posts a video explaining how they can vote and support his film, as one presumes he will, they aren’t going to enter into that survey process wanting to make a measured subjective judgment. They are going to help him win, because they are fans that want to support the subject of their fandom. Any system that would make this a fair fight for Martemucci would have to actively try to exclude these more rabid fans from the voting process, and that would go against the spirit of the audience making their voice heard in this process in the first place. It would also work against the simple reality that The Chair as a television series needs Dawson’s fans. I won’t attempt to claim there were no other reasons to bring Dawson into the project, but Starz and The Chair have not been shy about using Dawson as a way to bring their show to a much larger audience than Starz’s traditional promotional apparatus would likely reach. When Dawson’s movie Not Cool released its trailer last week, it debuted exclusively on Entertainment Weekly’s website; meanwhile, the trailer for Martemucci’s Hollidaysburg, although based on tweets ready around the same time, will not be released until this coming week. This privileging of Dawson’s film as a form of promotional outreach extends to Dawson’s website for Not Cool, where he has been encouraging fans to sign up to receive email updates about the film—as part of that form, his fans are able to opt-in to also receive emails about The Chair. As much as Moore stressed during the panel that Dawson’s YouTube fame has yet to translate into more traditional metrics of success, the fact remains that The Chair is unlikely to draw a tenth of Dawson’s YouTube subscriber count in total viewers when it debuts on Starz in September. If Martemucci represents the series’ claim to independent film legitimacy, Dawson is its link to popular media, a link they are relying on to get the word out about the series and the movies. In the process, though, The Chair makes it more and more difficult to imagine a scenario where any kind of online, audience-voting-based competition is going to result in a fair fight. Martemucci’s film may end up better than Dawson’s—I am certainly more interested in it, acknowledging that I’m not the target audience for Dawson’s style of comedy—but the idea of a system that manages to counterbalance the drastic gap between their respective online followings frankly seems naïve. The contrast between Martremucci and Dawson’s backgrounds is one of the most interesting details about The Chair as a documentary, but it’s also what risks sinking The Chair as a competition. Given that voting won’t be formally starting until episode eight, Moore has plenty of time to iron out the details of the survey, but in the meantime I would say that the chances of Dawson’s legions of fans not winning him the $250,000 prize look pretty slim. The Chair debuts on Starz on September 6—both Not Cool and Holidaysburg will have a brief theatrical run before then, before then being available on Starz alongside the documentary.